MAKE YOUR RUNNING SESSIONS COMFORTABLE AND STYLISH WEARING THESE ORANGE COLOURED AIR RELENTLESS RUNNING SHOES. OFFERING GREAT COMFORT, CUSHIONING AND STABILITY, THESE LACE-UPS ARE A MUST-HAVE IN YOUR FOOTWEAR COLLECTION. OTHER SPECIFICATIONS: BREATHABLE MESH UPPER MESH LINING FOR ENHANCED BREATHABILITY RUBBER SOLE FOR GREAT TRACTION ON THE SURFACE. Color may vary suject of availablity. This is a Portable USB Power Bank. This can be easily used with any type of mobile phone, media player, tablet PC, Digital camera or any Electronic device needing 5 Vol Input. Take this compact portable Power Bank charger anywhere with you and avoid disappointing moments by recharging your gadgets that are running low on battery . When needed , you can also use high power LED torch available in some of the power banks . 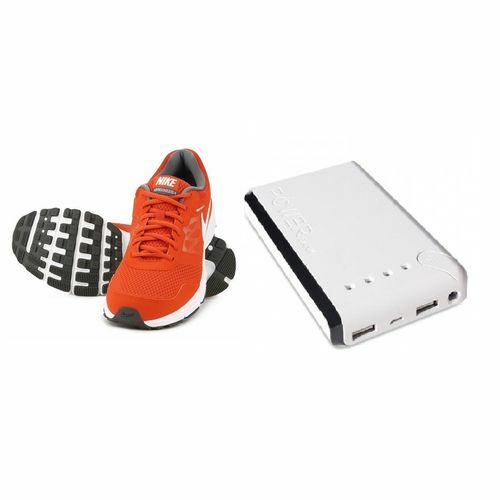 The Power Bank comes with Original Real Capacity Cells inside which provides minimum 500 charging discharging cycle life. This means you are buying a power bank particular capacity not for 3 or 4 months but it will maintain the claimed capacity for around 2 years . Cheap power banks have lower cycle life will lose its capacity in 5- 6 months and will cost you more ultimately .Constant current and constant Voltage during the entire duration of charging the mobile . MAKE YOUR RUNNING SESSIONS COMFORTABLE AND STYLISH WEARING THESE ORANGE COLOURED AIR RELENTLESS RUNNING SHOES. OFFERING GREAT COMFORT, CUSHIONING AND STABILITY, THESE LACE-UPS ARE A MUST-HAVE IN YOUR FOOTWEAR COLLECTION. OTHER SPECIFICATIONS: BREATHABLE MESH UPPER MESH LINING FOR ENHANCED BREATHABILITY RUBBER SOLE FOR GREAT TRACTION ON THE SURFACE. TypeRunning Shoes Sole MaterialRubber Inner LiningMesh ClosingLace-up Tip shapeRound TechnologyAir FitRegular Ankle HeightLow Ankle Upper Material DetailsBreathable Mesh Color may vary suject of availablity. Power Bank This is a Portable USB Power Bank. This can be easily used with any type of mobile phone, media player, tablet PC, Digital camera or any Electronic device needing 5 Vol Input. Take this compact portable Power Bank charger anywhere with you and avoid disappointing moments by recharging your gadgets that are running low on battery . When needed , you can also use high power LED torch available in some of the power banks . The Power Bank comes with Original Real Capacity Cells inside which provides minimum 500 charging discharging cycle life. This means you are buying a power bank particular capacity not for 3 or 4 months but it will maintain the claimed capacity for around 2 years . Cheap power banks have lower cycle life will lose its capacity in 5- 6 months and will cost you more ultimately .Constant current and constant Voltage during the entire duration of charging the mobile .